And then I found myself standing in the belly of a dropship, looking down out of the open bay door at the city below and finally leaping out with my friends. With that first jump out of the dropship, I fell straight into Titanfall’s story and found myself totally immersed in its universe. The greatest leap of faith you’ll ever make. There are plenty of other reviews out there that point out exactly why this game works so damn well on a technical level, but so little of it seems to focus on just how much effort clearly went into story and making sure the game immersed you in that story. Perhaps it’s because, like I pointed out in September, telling a good story is a magic trick and if you’re a good enough magician, people won’t even realize it’s a trick so they understandably haven’t covered it. Yet Respawn Entertainment have done such an outstanding job with these small details that it absolutely deserves as much praise as I can heap on it. Telling a good story in a video game is a totally different animal from every other medium, and the small, intricate details you’d never bother describing in a book can be vital to immersing a player in a video game’s story. Jumping off that dropship and hearing your commander’s orders really draws you into the story, and suddenly you feel like your really part of a military operation and not just some mindless grunt. Your commander also keeps you constantly up to date with how the battle is going, letting you know when you’ve lost objectives or if the enemy team is ahead of you in points. The constant tactical updates makes sure you really feel like you’re in a battle rather than just a competition in a video game. The small team sizes, 6v6, also means that you’re constantly playing a significant role in the battle. I never once felt like I was just a faceless, unimportant pawn while I was playing Titanfall, and that went a long way towards making me feel like a highly-trained Titan pilot and drawing me further into the story. You might be wondering how you can feel like you’re in a real battle if there are only 12 people on the map, because I was wondering the same thing. Well that’s what the Grunts are here for. They’re NPCs that populate the map and fight each other, creating the swirling chaos of battle as they maneuver around the map. Not only do they provide a much needed sense of life and urgency to the battles, but they also make sure that traveling across the maps is never boring. 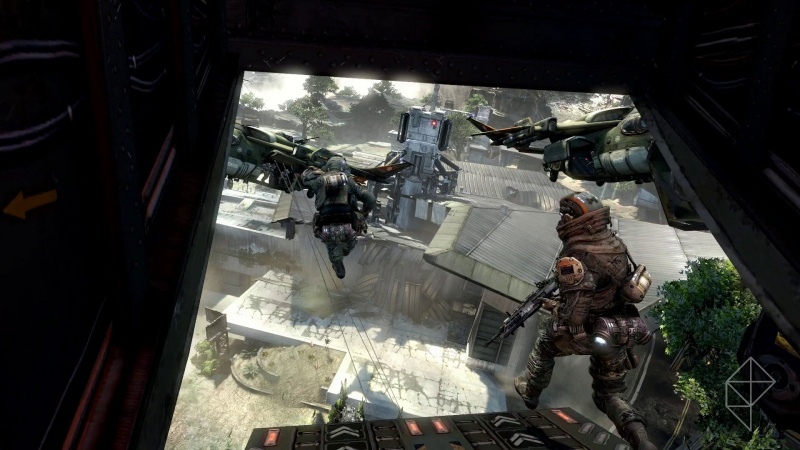 I would been happy if they’d just added the grunts, but Respawn Entertainment went one step further and actually gave these NPCs a life of their own. Finally, a game that actually plays like its promotional material! While these may not sound significant, and in fact aren’t significant in terms of gameplay, they’re absolutely critical to a good video game story and play a huge part in why I found myself completely immersed in the story. 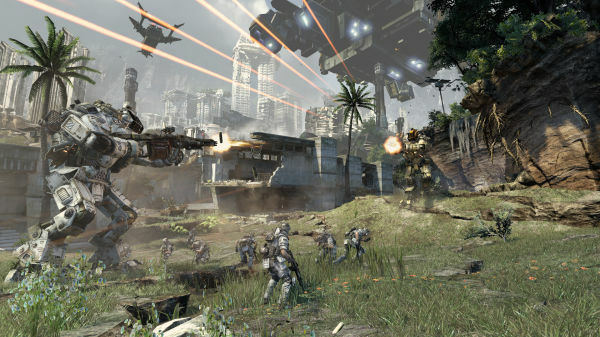 Of course the game is called Titanfall, not Gruntfall, and when you get your first titan I guarantee you’ll be grinning ear to ear. Oh I’m sorry, you weren’t using that were you? 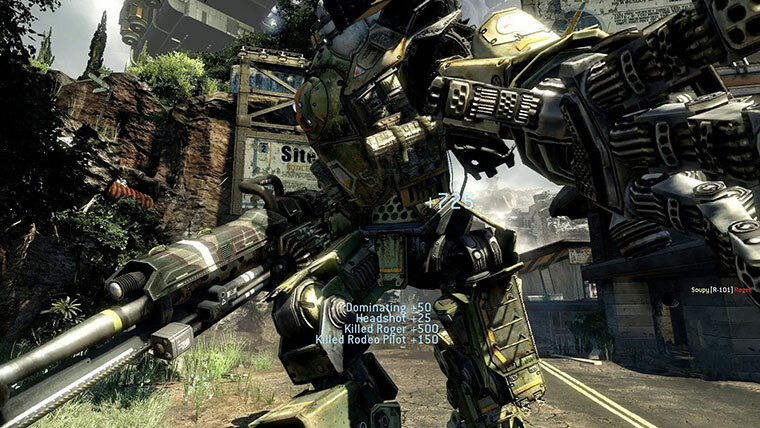 The Titan is more than just a suit of armor or a walking tank, it’s your buddy. He’s got your back when you need to go inside a building to cap an objective and when things get hairy and you need to leap out of a window to escape, he’ll be there to catch you. 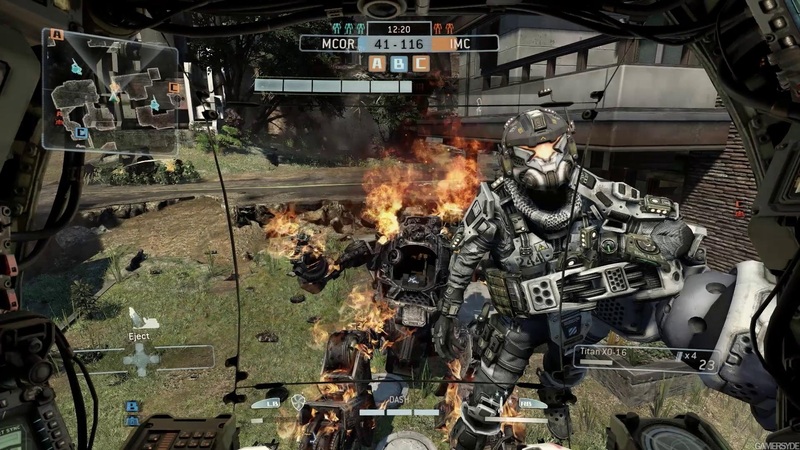 When you’re running towards your Titan with bullets whizzing all around you and the sound of a stomping Titan chasing after you, only to have your Titan reach out and place you in the safety of its cockpit, you’ll probably feel like that’s the greatest thing you’ll ever experience in Titanfall. Then when you turn around, rip the enemy pilot out of his Titan, gun down the remaining grunts and leave them behind in a field of burning wreckage, and you realize how wrong you were. Like everything else, your Titan is designed to immerse you in the game as well. Everything from the animation of taking your seat in the cockpit and watching the viewscreen flicker to life, to listening to the computer warn you of 3-to-1 odds, makes you feel like you’re really piloting this awesome war machine. The Titan is also a character of its own, and once you’ve customized it to fit your style and play with it for a couple hours, it really will seem like an old friend. It’s almost like a loyal dog, and it’ll gladly follow you into the mouth of hell. “Come on, get in, we’ve got work to do!” – Your Titan. Thanks for this. I too played the beta, didn’t notice all of the little things you mentioned (only got a couple of hours of time in 🙂 ) but I was really a lot more impressed with it than I thought I would be, it was surprising! I couldn’t quite put my finger on “why” I was so impressed with it – seems well-balanced technically and fun, but I like your take on it. Have already pre-purchased and pre-loaded it along with a lot of my gaming friends, and can’t wait for tonight! Yeah, it’s just overall a great game. I wasn’t able to play it on launch day due to my schedule, but I’m just getting ready to dedicate some time to playing tonight and tomorrow. opponents, and maybe even your special someone.